Complementing the lens itself, the FUJIFILM XF 200mm f/2 R LM OIS WR Lens with XF 1.4x TC F2 WR Teleconverter and UV Filter Kit from B&H bundles the telephoto prime with a 105mm UV filter. Distinguished by its long reach and bright design, the FUJIFILM XF 200mm f/2 R LM OIS WR is a 305mm-equivalent lens further characterized by its sophisticated optical layout, fast performance, and apt image stabilization. Well-suited for sports, events, and wildlife photography, the impressive f/2 maximum aperture suits working in a variety of lighting conditions and also promotes working with shallow depth of field and selective focus techniques. The optical design features three extra-low dispersion elements, including one Super ED element, which help to achieve greater clarity and color accuracy by controlling fringing and chromatic aberrations. A Super EBC coating is also used to suppress flare for improved contrast and color rendering. Complementing the optics is a linear motor-based autofocus system, which offers fast, near-silent performance for both stills and video use. Additionally, a five stop-effective optical image stabilization system minimizes the appearance of camera shake for sharper results. Suiting the lens's use in inclement conditions, it is also weather-sealed to resist and dust and moisture and a fluorine coating has been applied to the front element. 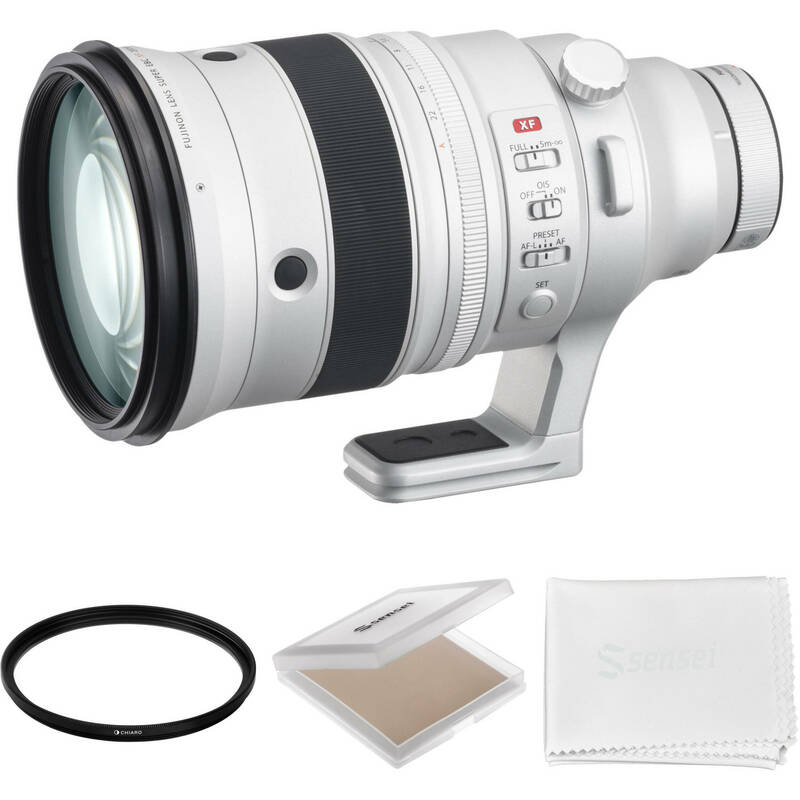 In addition to the lens itself, the dedicated XF 1.4x TC F2 WR Teleconverter is also included in this kit, and extends the focal length by 1.4x to result in an equivalent 427mm focal length. This teleconverter maintains all automated functions and image stabilization, and its optical design incorporates one aspherical element to control distortion and spherical aberrations. Telephoto prime lens is designed for APS-C-format FUJIFILM X-mount mirrorless cameras and provides a 305mm equivalent focal length. Notably fast f/2 maximum aperture affords greater control over depth of field for isolating subject matter and also suits working in low-light conditions. Three extra-low dispersion elements, including one Super ED element, are used to greatly reduce color fringing and chromatic aberrations in order to produce high clarity and color fidelity. Linear motor autofocus system delivers smooth, near-silent performance that is especially beneficial to video applications and when working in noise-sensitive areas. An additional mechanism also fixes the focus motor group in place when the camera is turned off to reduce any unwanted vibrations during storage or travel. Focus range limiter switch allows you to constrain the focus range to between 16.4' to infinity or for the whole 5.9' to infinity range for more responsive focusing depending on the distance to your subject. Focus Preset Function instantly changes your focus position to a pre-selected position for faster focus switching. Focus Control button at the tip of the lens can be assigned to a desired focusing function of choice, including Focus Preset, AF-ON, or Focus Lock. Optical stabilization system minimizes the appearance of camera shake by up to five stops to enable sharper imaging when shooting handheld or working with slower shutter speeds. The lens body incorporates 17 distinct weather seals to protect against dust and moisture, and to enable worry-free use in inclement conditions and freezing temperatures as low as 14°F. A fluorine coating has been applied to the front lens element to guard against smudging, moisture, and dust. Fixed rotating tripod collar offers well-balanced support when working from a monopod or tripod. The tripod foot is also Arca-type compatible for direct mounting to tripod heads and also has 1/4" and 3/8" sockets for attaching to quick release plates. Included with the 200mm f/2 lens is the dedicated 1.4x teleconverter, which extends the effective focal length to 280mm, for an equivalent focal length of 427mm. Optical design has seven elements in four groups, including one aspherical element to reduce distortion and maintain high sharpness. Retains all AF, AE, and image stabilization functions of the 200mm f/2 lens, as well as the same minimum focusing distance of 5.9'. Requires one additional stop of light, making the effective maximum aperture f/2.8. Teleconverter adds an additional 0.6" to the overall length of the lens system along with an additional 4.6 oz of weight. Useful for minimizing reflections and glare and enhancing the overall color and tonal saturation is the 105mm Ariel Circular Polarizing Filter from Vu Filters. Utilizing HiVu Polarization Optics it filters out light that has become polarized due to reflection from a non-metallic surface, resulting in a noticeable increase in the saturation of skies and foliage, as well as clearer imagery when photographing in hazy conditions. A circular polarizer differs from a linear polarizer in that it supports full use of a camera's autofocus and auto exposure functions. Further enhancing image quality is a White Balanced Multi-Coating that ensures that there is little to no color shift. Also, a Flat Wave Coating makes the filter's front surface exceptionally smooth for easier cleaning and maintenance. There is also a UV Rejection Coating that reduces UV reflections and ghosting. This filter is hand crafted and individually inspected for ensuring quality and uses impact resistant Ultra-White Schott glass for maximum performance. The glass edge is black to prevent internal reflections and helps seals the edge. Also, the black anodized CNC aluminum filter frame has Integrated Optik Lock technology that seals the front of the lens from the environment for additional protection. The 105mm Ariel UV Filter from Vu Filters is a general use, clear filter designed to absorb ultraviolet light and reduce the bluish cast of daylight. Aside from the reduction of unwanted blue casts, no additional coloration or contrast is created, and adjustments to exposure are not required while using this filter. To prevent internal ghosting and reflections, each glass surface is multi-coated. These coatings also greater protection to the filter substrate and help to ensure color fidelity. Ariel UV filters are constructed from Schott glass with a black rim. Set within an aluminum-alloy filter ring that is durable while remaining lightweight, the glass provides increased clarity as well as color fidelity while the black rim further ensures that reflections do not occur along the filter's edge. The filter ring is also weather-sealed, which contributes to this Ariel UV filter's ability provide general protection for a lens at all times. Such filters help to reduce dust and moisture from reaching your front lens element and provide additional protection in case of drops or situations where scratching could occur. Multi-coated to prevent internal ghosting and reflections as well as to ensure color fidelity. Black rimmed glass further ensures that reflections do not occur along the filter's edge. Aluminum-alloy filter ring is durable while remaining lightweight. Side knurling provides a more textured grip when mounting or removing it from a lens. 105mm front filter threads allow for use with other filters. Weather-sealed general protection filter reduces dust, moisture, and scratches from reaching lens elements. This Filter Jewel Case from Sensei holds one filter up to 105mm when not in use. Made of impact-resistant plastic with a foam liner on the bottom, this case will protect your filter from unwanted moisture and dust when stored within your camera bag or on a shelf in your studio. It is sold here as a spare or replacement item. Box Dimensions (LxWxH) 17.0 x 13.0 x 11.25"
Box Dimensions (LxWxH) 5.3 x 5.2 x 0.8"
Box Dimensions (LxWxH) 5.3 x 5.1 x 0.8"
Box Dimensions (LxWxH) 7.165 x 5.039 x 0.551"